I've been looking forward to Blue Bloods Season 8 Episode 18 since I read the description before it aired. 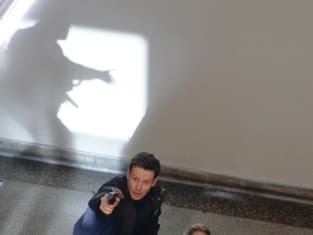 First off because Jamie and Eddie have been criminally underused during Blue Bloods Season 8, and Eddie taking a bullet to the vest meant that she and Jamie would get real screen time. But mostly because it finally appeared that we might get some forward momentum concerning the relationship between these two characters whose feelings run so much deeper than just partners. I'll admit that I love Eddie Janko, especially during moments such as when she was lying in her hospital bed trying to figure out what to say to the Police Commissioner. The expression on her face was priceless. And even while being sore from a bullet to the vest, she took the time to make sure Frank knew that Jamie followed procedure and did everything right. She also turned down a possible promotion, saying she was happy exactly where she was, which made me wonder how much of that statement was about the job and how much was about her partner. But this near tragedy was all about Jamie realizing what it meant for he and Eddie to only be partners. His crestfallen look when he realized that Barry would be taking her home from the hospital was a little bit heartbreaking. You don't regret the great relationships that failed, you regret the ones you never followed through on. In the end, it looked as though Jamie was going to wipe away that line in the sand and see where that leads, or at least tell Eddie he was interested in doing just that, but then Barry walked in. Part of me understood why Jamie dropped it, even when Eddie pushed him to come clean. It would be a little cruel to ruin her night out with surprise Broadway tickets. She certainly deserved to go out and have a little fun. But I hope that Jamie doesn't take the cowards way out and drop the subject completely. I want to think more of Jamie Reagan than that, and I'd also hate for this will they/won't they relationship to get dragged out even longer. I, for one, am tired of waiting. Elsewhere, Frank went yet another round with Mayor Dutton, but thankfully, this looks as though it's going to be his last. The mayor coming across as anti-police has become tedious, but watching her act stupidly in a myriad of situations has become downright painful. I generally like actress Lorraine Bracco, but I've hated this character from the moment she appeared, and Dutton's comments during the press conference made it difficult not to side with the police when they turned their backs on her in protest. Given that the mayor said she enjoys leading a good protest, she should understand where they were coming from. I would like you to put on an NYPD uniform, and 20 lbs. of equipment, and a gun belt, and run up six flights of stairs to save a woman who is being beaten by her boyfriend, and then, I would like you to be raked over the coals for your effort. And then, when you have that frame of reference, maybe we can talk. I don't think I've ever liked the mayor more than when she told Frank she wasn't going to run for election, mostly because it was simply such a relief to hear it. That, and that she believed Frank Reagan to be a genuine guy, even if she frequently disagreed with him. Finally we got to Danny's cold case. I appreciated this case because it wasn't about Danny being a hot head as much as it was about him empathizing with someone who had lost a loved one and no one seemed to care. On the flip side, I hated how he railed against Erin for dropping the case. She was right, the ID was tainted and without any further evidence the case would have gotten kicked out of court. One of them thought you were cute. I guess that's what happens when it's 3am and you're drunk. Permalink: One of them thought you were cute. I guess that's what happens when it's 3am and you're drunk. Neither Danny nor Anthony are willing to back down or walk away until a case is solved, but they can't help but insult one another every step of the way. Related: SEAL Team and S.W.A.T. Renewed at CBS! Lastly, there was Erin's latest run in with her ex, Jack. Jack was right in almost all parts of their encounters. Defending Malcolm James was simply him doing his job and that's the way the justice system works. Also, Erin is quick to accuse and slow to apologize. I give Jack credit for admitting to why he carries around that photo of their wedding day. It reminds him of the best times of his life. He's obviously still in love with Erin, and even she admits that he was her best, and worst, romantic partner. No matter how badly this relationship ended, these two keep on coming back to one another. So TV Fanatics, should Erin give Jack another chance? Will you be sorry to see Mayor Dutton go for good? And should Jamie and Eddie finally give a romantic relationship a try? 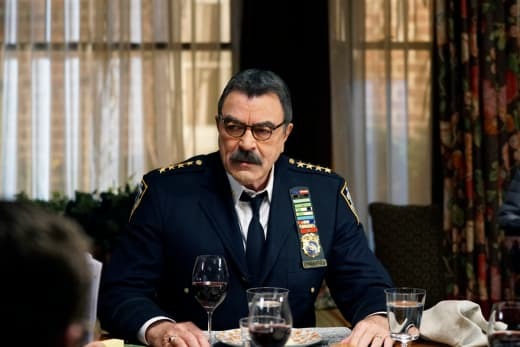 Check back for my review of Blue Bloods Season 8 Episode 19, and if you can't wait for my of the Reagan family, you can watch Blue Bloods online here at TV Fanatic. Listen, anyone, especially a minority being chased by police, would be afraid for their life. Permalink: Listen, anyone, especially a minority being chased by police, would be afraid for their life.